Given the excitement attached to this match, it was no surprise to see the huge crowd of 20+ people arriving from all over South West London and supporters were pleased to sink their first alcoholic drink of the evening after squeezing onto the mainline trains, which were clearly struggling to cope with the sheer volume of fans travelling to this sold out fixture. 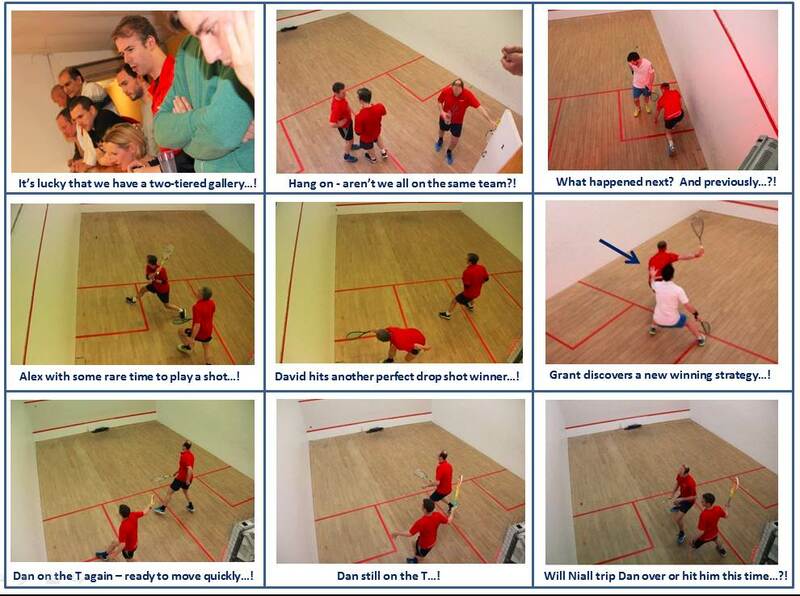 Fortunately our two-tier squash gallery was “comfortably” able to accommodate our strong home support, plus various away fans, and there was even space for a number of red Knole Park balloons which we assume were brought along by the opposition fans. And how lovely it was to also see a number of the Spencer Club ladies team supporting us, in addition to the players’ other halves. We will return the kind gesture when we support you all during the Spencer Squash Club Ladies Championships on Saturday 23rd April at 3pm. First up at second string, was Grant versus James. This was always going to be a great game from the moment that the first rally finished after about 7 minutes and 53 seconds. Both players opted to have a good run around the court and limit their drop shots during the first set which ended up becoming an incredibly long set. Various supporters and other players mentioned that they felt dazed, dizzy, exhausted and even slightly amazed by the impact of watching this contest, even though it was still during the first set of the match…! Grant played very well to take the first set and fire Spencer Club into the lead…! Grant then stormed into a commanding 6-1 lead in the second set after another cluster of incredibly long rallies in a match that had already been going for about 25 minutes. People could have been forgiven for thinking that this was going to be a home win, only for James to pull back to 7-6 up, then Grant to go 8-7 up and then James to eventually win the set 10-8…! 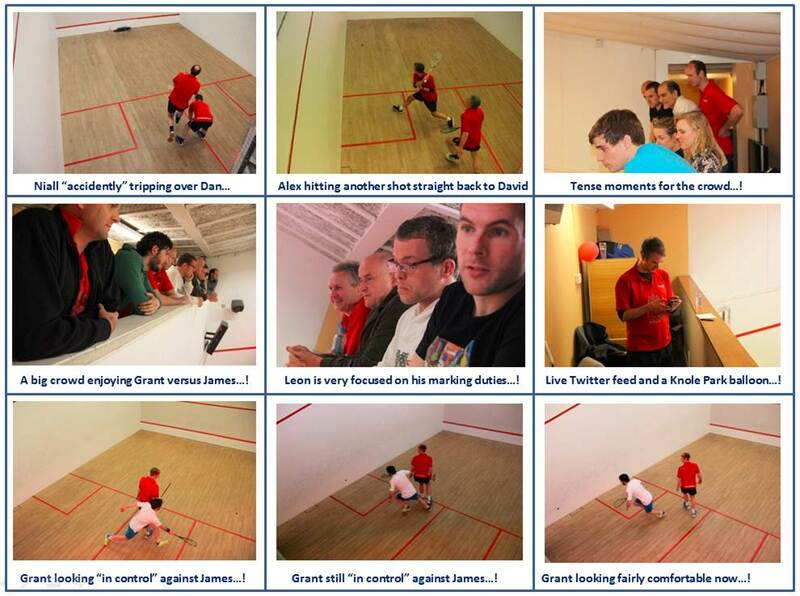 As the match continued and the impact started to show, James found his length and executed a number of tight volley drops in order to move Grant around the court. Both players continued to play incredibly well but James managed to take the third set 9-4 and then led 8-3 in the fourth set, only for Grant to storm back to 9-8 after putting in a huge amount of effort. An exciting battle at game point for Grant to take this match into a fifth set ended with another fantastic twist as James sealed the fourth set 10-9 to win the match 3-1. A wonderful battle and well played to both players…! At first string, our planned number one Jannus was unavailable, having been summoned to Buckingham Palace to collect his prize for being the European Young Technology Expert of the year, whilst our other regular number one Jamie spent the evening on Roman Abramovich’s luxury yacht in Monaco, along with a number of high profile guests including John Terry and various people on the RED/AMBER lists, with the intention of trying to persuade Romelu Lukaka to return to Chelsea for a bargain price of £60m, continuing Chelsea’s recent new transfer strategy of paying ridiculously huge sums of money to buy back players who they had previously sold for small amounts several years earlier. Therefore Alex stepped up as our Spencer Club number one (a proud moment for the youngster despite wearing a Knole Park squash shirt throughout!) and took on David, an incredibly smooth and effective player who makes squash look so easy that it is like watching somebody play the piano…! This was always going to be a big ask for Alex, however it was actually a very close and intense contest right the way through the match until 2-2 in the first set (after about 15 seconds of match play), before David started to show us why his opponents find it so difficult to play against him. A combination of sharp footwork, wonderful disguise, incredibly tight drop shots with a perfect follow-through, ridiculously tight boasts and fantastically well-executed lobs. 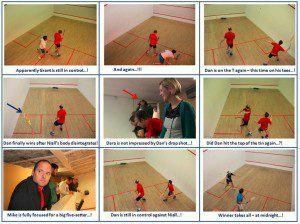 It was like watching Dan play at times…! ☺ Alex certainly tried his hardest but this was never going to be an easy match. 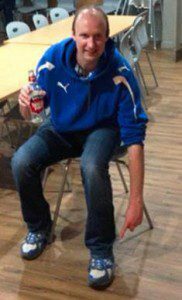 Hopes of an upset from the fiery home crowd soon faded as David took control and sealed a well-earned 3-0 victory to put Knole Park 2-0 ahead on the night. Next up on court number one was supposed to be Jason however he suddenly realised that he had forgotten his squash trainers (not for the first time?!) and hence had to quickly dash home. 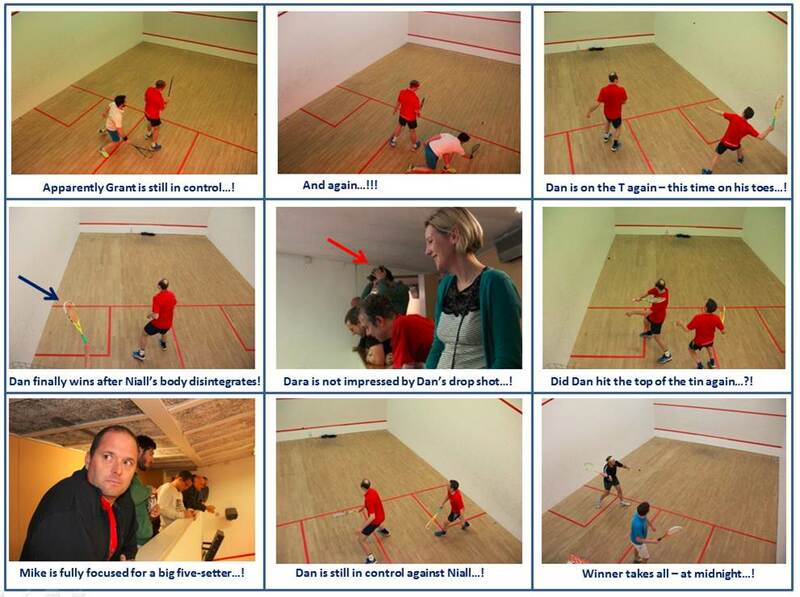 Therefore, Spencer Squash Club captain Dan stepped onto the court against fierce rival and ex-Spencer youth team player Niall at third string. The home crowd clearly had their favourite and expectations were high, however after a tough battle through to 5-5 in the first set and Niall having already re-tied his shoelaces during at least four of the gaps between rallies, Niall hit four dodgy frames in a row, fluked a nick on an over-hit length and somehow stole the first set 9-5. Dan was determined to comeback and quickly marched into a comfortable 6-1 lead, despite Niall claiming that one of his serves had hit Dan’s leg (something that never happens given Dan’s rapid footwork when returning body serves!) Niall also claimed that one of Dan’s serves was out and stopped play, despite the ball clearly being in, but the marker took pity on him and they replayed the point. Niall desperately needed a plan B and saw the opportunity as Dan crossed him to return one of his poor lengths. Out came Niall’s foot, causing an inevitable collision and Dan crashed to the floor with a twisted ankle, in obvious agony. The alcohol-fuelled home crowd screamed abuse, the homemade stretcher comprising of everybody’s racket cases tied together appeared on court and Dan took a much needed injury break (Knole Park Captain John confirmed that 15 minutes are permitted if it is a blood injury which was deliberately caused by the opponent – blood was clearly spotted inside Dan’s body hence qualifying for such a recovery period). Then saw a wonderful gesture from the opposition when James lent Dan his ankle support to give him a chance of continuing this contest despite everybody else insisting that Dan should stop given that this was only a friendly. However, this was never a friendly match and Spencer Club were already 2-0 down hence this game needed to be won…! Dan stepped back up and took the second set 9-2 with some good limping around the court. Dan then very comfortably won the third set 10-8 after another five shoelace adjustments from Niall and a few more dodgy frames, before Niall got lucky (despite playing some very good shots) and won the fourth 9-2 after a long strategic chat with his fellow team members. The crowd continued to become more vocal and abusive as the match continued! So into the fifth set and despite Dan’s inability to walk, one sensed that it was going to come down to fitness, which potentially favoured Niall given his previous role as the Spencer Club Fitness Coach! However, after a few long rallies early on, Niall started to struggle, dropped the ball to the other side of the court several times, lost track of the score many times, kept forgetting which side he was serving from, continued to suffer from his ongoing shoelace issues and even discovered that he had a dodgy contact lens which he needed to spend a few minutes sorting out. None of these well-known “time-wasting tactics” were enough though and Dan took the fifth set 9-4 after a long battle at 4-4 which seemed to finish Niall off. So 2-1 to Knole Park on the night and the match very much still alive! Another marathon encounter took place on court number 2 and Leon battled hard against Mike at second string. I did not have the pleasure of witnesses much of this match, despite it lasting about an hour and 15 minutes, given that I was on the other court throughout, however from the few rallies that I did see it was clear that there were lots of well-fought battles and that both players were clearly enjoying some great strategic squash. I heard somebody mention that it was like watching a chess match as both players looked to execute winning combinations of shots, only to find their opponent somehow recover the ball and get back into position again. In terms of the scorecard, Leon took the first set 9-3, only to see Mike recover well in the second set to win 9-7. Leon then focused and played some good squash to win the third set 9-2 and look in control, only for Mike to come back and win the fourth set 9-2. Leon then started the fifth set superbly well and charged into an 8-2 lead to earn his first match point. However, Mike showed great resilience and found plenty more energy to come all the way back to 7-8 and suddenly looked like he might win. Many bets were exchanged on the balcony and eventually Leon clinched the third 9-7 to level the match at 2-2…! So finally, at about 10pm, Charlie and Jason stepped onto court one to enter into a battle at fifth string. This was to be the decisive match to settle this wonderful tie and one always felt that it was meant to be given the huge rivalry between these two youngsters! As the excitement grew amongst both sets of supporters, the first obvious challenge was to determine who was actually playing for each team given that both players are from Spencer Club! It seemed only fair to offer the choice to the Knole Park Captain and, after a bit of research, John elected to have Charlie on his team despite him being ranked about 800 points behind Jason. Maybe this had something to do with the fact that Charlie had almost already won the first set by the time that this decision was made – or potentially the fact that Jason had used up lots of energy heading back home to collect his squash trainers…! Spencer Club were not complaining though as their fans had recently witnessed Charlie’s lack of form after his defeat to Mike Pan last week and they remained calm as Charlie took the first two sets 9-6, 9-2. The gallery was at full capacity going into the third set at about 10.30pm, despite many of the supporters finding it all too much for the nerves and relocating to the clubhouse bar. Another great battle in the third and Charlie’s legs started to fade as Jason won the third set 9-3. By now it was 10.45pm and the crowd agreed that the fourth set was going to be the final set, regardless of the outcome, given that dinner was ready and the bar was about to enter into last orders. But fortunately for Knole Park, Charlie recovered well and took the fourth set 9-5 to wrap up a victory at 10.58pm just in time for closing orders at the bar! So into the clubhouse in order to reflect upon a wonderful 3-2 marathon of a match, by far the latest finish that we have ever witnessed in my time at the club! Both sets of players and supporters enjoyed their chilli con carne (or so they told me!) I normally end up taking home lots of yummy leftover food for the next day however this time the players and supporters were so hungry that all of the food was swiftly consumed. In fact, the only leftovers were a blue sweatshirt, light grey tracksuit bottoms, a green Dunlop squash racket, a squash ball tube containing one ball and John’s pen (which I will bring to the next Knole Park match). Any claimants for these items – I think that most of them belong to Alex who presumably walked home semi-naked through Earlsfield…! Well played everybody and a wonderful night! Many thanks to all of the players and supporters, and most surprising, many thanks to Charlie for helping to wash up! (supported by Leon, Lana and Dan). Thanks also to John for taking some wonderful photographs to capture the huge occasion. See below for some samples…! We look forward to the return match at the end of the Summer. No Replies to "Spencer 1 vs Knole Park 1 ("Friendly") - Match report"